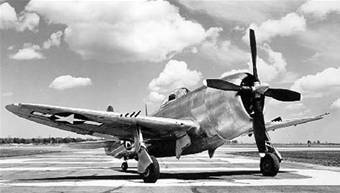 On Sunday, June 27, 1943, a U.S. Army, P-47B (41-5951), piloted by Robert McKeith 19, left Long Island, New York, and was passing over Long Island Sound when the plane caught fire. His aircraft, trailing brown smoke, was seen by aircraft spotting posts in Westbrook and Deep River Connecticut. As McKeith passed over Westbrook, he aimed his aircraft towards Wrights Pond and away from any populated areas. At this point the smoke and heat became too much and he bailed out and landed safely. The P-47 came down in a wooded area near Wright’s Pond in the Pondmeadow district of Westbrook. The cause of the fire was not stated. McKeith was from Rochester, New York. His rank was not stated.